In a recent Journal of Physics: Condensed Matter article invited as part of the Emerging Leaders special issue, Zhimin Liao and his team explore magnetotransport properties around the Dirac point in 3D Dirac semimetals. Dirac quantum materials promise to revolutionise future electronics. Recently, the 3D realization of graphene-like materials, i.e., Dirac semimetals,has given rise to intriguing Dirac fermions in three-dimensions with ultrahigh mobility. 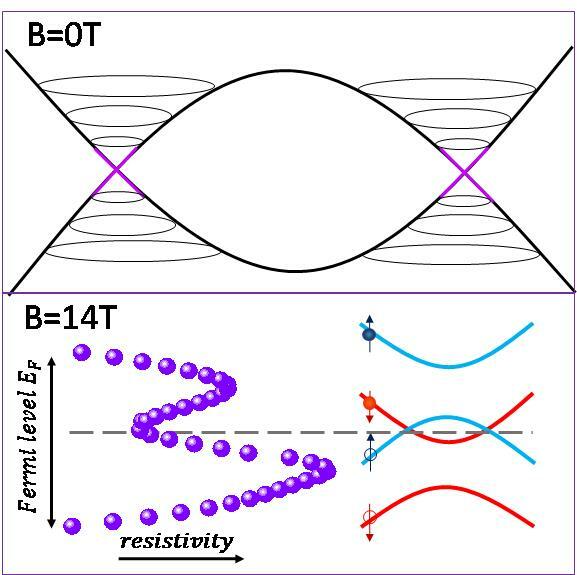 By breaking time-reversal symmetry, the 3D Dirac point may evolve into a pair of Weyl nodes, giving rise to long-sought Weyl fermions that are still not found in high-energy physics. The unique properties of the DP are expected to occur as the Fermi-level is close to the Dirac point. Thus, it is of great interest to explore how the Dirac or Weyl fermions behave around the Dirac point. However, direct access of the Dirac point faces great challenges due to excessive carriers in bulk materials. In this work, we fabricate a nano-device based on high-quality single crystalline nanowires facilitates the tuning of Fermi-level, and thus provides an ideal platform to investigate the physics of 3D Dirac semimetals. Under a strong magnetic field, degenerate energy bands with opposite spins are separated in energy by the well-known Zeeman Effect. It is curious how this strong Zeeman splitting affects the Dirac point, given that the Dirac semimetal Cd3As2 has a large Lande g factor. Our results show that the effect of Zeeman splitting gradually dominates band structure evolution, as increasing the field leads to the crossing of sub-bands and corresponding resistivity drop at the Dirac point. Our current research is focused on quantum transport and optoelectronics in Dirac/Weyl semimetals, graphene, and topological insulators. More information can be found in the group website here.